Washington DC – 2017 saw across the board increases in the number of high quality CAPA Certified parts available to the U.S. market. In addition, CAPA has qualified 6 new manufacturers who have passed CAPA’s intense factory approval program. “Clearly, these 68 CAPA manufacturers see a significant market advantage in meeting CAPA’s quality standards for true functional equivalency,” said CAPA’s Executive Director, Jack Gillis. Based on distribution of the unique yellow and blue CAPA Quality Seal, manufacturers have increased seal requests by 19% over last year. This is 1,600,000 more than 2016 for a record total of 9,912,000 in 2017. This 19% increase significantly exceeded the 12% annual average increase CAPA has been experiencing during the past five years. As of the December 31, 2017, CAPA increased the number of part applications in the program by 14% with total part applications approved jumping from 23,721 to 27,053. This is second highest number of new part applications added to the program (3332) in CAPA’s 30 year history. These statistics are a strong indication of the importance of CAPA Certified parts to collision shops seeking to keep vehicles repairable without compromising quality. “While shops and insurers are using (and requesting) more and more CAPA Certified parts to reduce the risks associated with aftermarket parts, the big winners are consumers who are getting more fairly priced, high quality parts for their vehicles,” said Gillis. Since 1990, CAPA has certified, and collision repairers have installed, nearly 92 million parts. 2018 has CAPA closing in on the 100 million mark, which is a tribute to the commitment of those manufacturers who choose to CAPA Certify their parts and those shops and insurers who insist on the CAPA Seal. The CAPA Seal remains the key to protecting consumers from poor quality and potentially unsafe parts. CAPA’s unique, two-part, seal proves to both consumers and insurers that true quality alternative parts were used. “Given the wide range of quality in alternative parts in the market, it is imperative to Look for the CAPA Seal,” said Gillis. 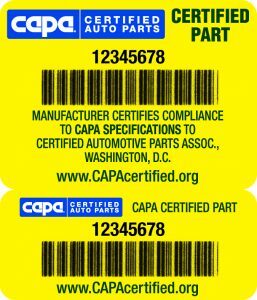 About CAPA: The Certified Automotive Parts Association, founded in 1987, is the nation’s only independent, non-profit, certification organization for automotive crash parts whose sole purpose is to ensure that both consumers and the industry have the means to identify high quality parts via the CAPA Quality Seal. CAPA is an ANSI accredited standards developer for competitive crash repair parts. For more information see CAPAcertified.org.